The Los Angeles office market continued to see sustained occupancy and rent gains into the fourth quarter of 2016. The vacancy rate fell 10 basis points to 10.7% from the prior quarter, and is 80 basis points lower than last year. Year to date, the office market has seen nearly 21.6 million square feet of leasing activity, while year to date sales activity surged to more than 26.1 million square feet. Average asking direct rents and sale prices continued to rise this quarter. 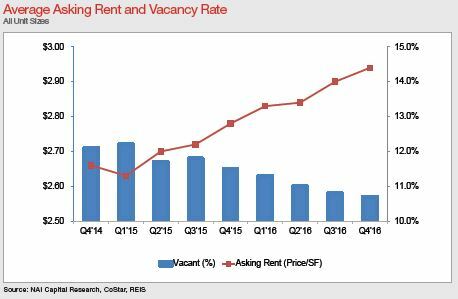 Average asking direct rental rates registered $2.94/SF, up 5.8% over last year. The Los Angeles market continues to attract billions in new investment. Total construction increased to 3.9 million square feet from last year, with 21% preleased at the end of the quarter. The strengthening jobs market is contributing to the demand for office space. Total nonfarm employment in Los Angeles County has increased by 1.5%, representing a net gain of 65,300 jobs from November 2015 to November 2016. Employment growth in office occupying sectors grew by 2.1%, representing a net gain of 37,800 new jobs over the same period. Since early 2012, preferences for creative office space have been one of the primary drivers for increasing average asking rents. 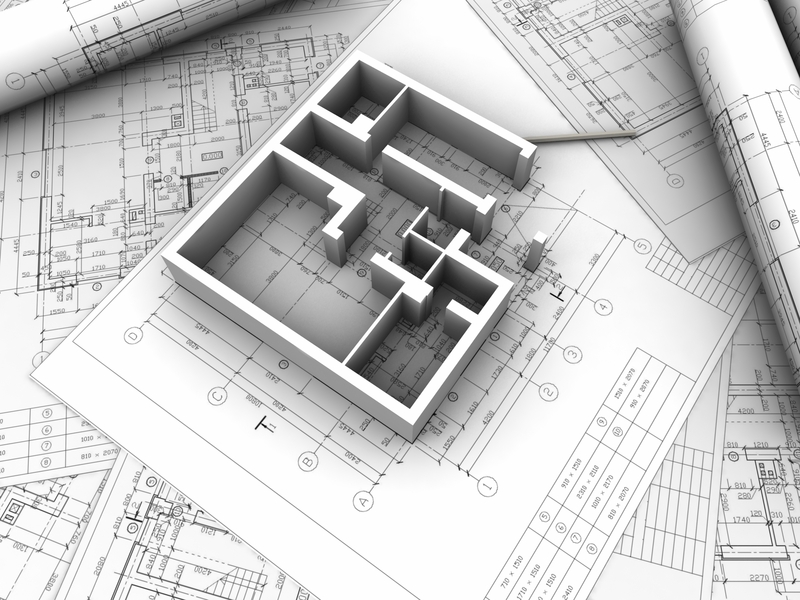 Although vacancy remains relatively high, much of the vacant space is confined to a handful of projects with traditional office space. By comparison, the market for creative space remains tight, and will continue to drive rent increases. Outside of Downtown LosAngeles, the majority of new construction is split between Hollywood, owing to the entertainment industry, and Playa Vista, with tech companies driving demand. Snap, Inc., the parent company of Snapchat, leased several spaces in the Santa Monica Business Park, totaling over 300,000 square feet. Sources close to the deal suggest that the current landlord, The Blackstone Group LP, may sell the business park to capitalize on the current market conditions. Occupancy rates in the Los Angeles office market increased to 89.3% this quarter, the highest since 2008. Over the year, nearly 3.6 million square feet of new occupancy has been added. In Downtown Los Angeles several major projects are under construction, including the Wilshire Grand Center and the Ford Building. Both are due for delivery in 2017, but the Wilshire Grand Center has yet to sign any tenants. They will be joined by Icon in West Hollywood, also scheduled for delivery in 2017, which is fully leased by Netflix. 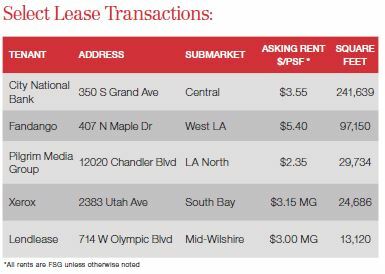 In the largest lease transaction this quarter, City National Bank leased 241,639 square feet in Downtown Los Angeles for $3.55/SF. Fandango preleased 97,150 square feet of creative office space in Beverly Hills at an asking rate of $5.40/SF. Overall, sales activity this quarter increased to 5.6 million square feet, representing an increase of 51% over the quarter. The yearly total sales volume of more than 26.1 million square feet is 79.8% higher than the total for 2015. This comes in spite of average sale prices at $536/SF, which remain 73% higher than last year. 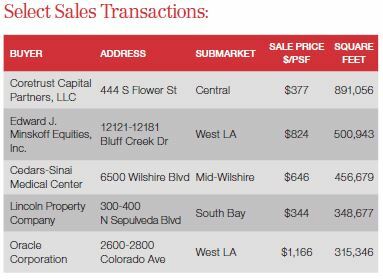 In the single largest transaction this quarter, Coretrust Capital Partners acquired the 891,056 square foot Citigroup Center in Downtown Los Angeles for $377/SF. In Playa Vista, Edward J. Minskoff Equities, Inc. acquired two class A office buildings in a portfolio totaling 500,943 square feet for $824/SF.